I have to start with a thank you to lovely Walkers for sending me a sample of their new Crinkles. They sent them in a plain white packet, so also very kindly sent me the image above to illustrate the proper final packaging. 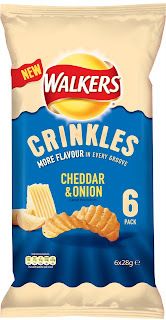 Crinkles are Walker’s new crinkle cut crisps (that’s a tongue twister) and will be available in Sweet Chilli, Simply Sea Salted, Salt & Malt Vinegar and Cheddar & Onion. I’m lucky to have received a bag of the Cheddar & Onion variety to test. I hurriedly opened the bag, keen to see what was inside. Pouring them out of the bag I soon spotted the new crinkles, and that these crisps have a sprinkling of some parsley on them too. The crinkles are quite wide and looked nice enough, so I tucked in. Wow these crisps are cheesy (but in a good way). They have such a wonderful strong flavour, first the mature cheddar hits then there is a sweet lightly spicy after taste from the onion. I think all this extra taste comes from the coating gathering in the ridge of the crisps, and the tag line on the front of the bag would certainly support this; “more flavour in every groove”. I also love the texture as the ridges make them extra crunchy. The flavours of these new crisps may not be that different from flavours already available but I do recommend giving them a try. The ridges really do add to the flavour and the texture, and are a lovely addition to the range. I just can’t work out why Walkers haven’t done this before. 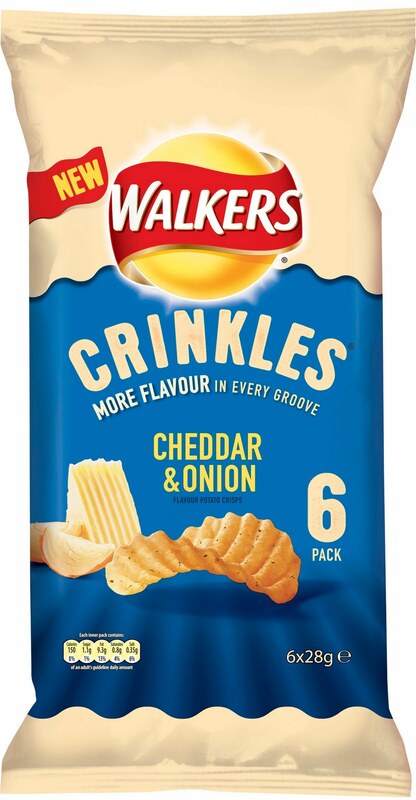 Walkers did produce Crinkles years ago. Cheese & Chive back then, I think.